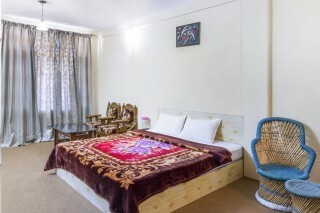 Situated a short walk away from Manali Club House (62 m), this is an offering of a private room in a guest house, which can accommodate up to three people. 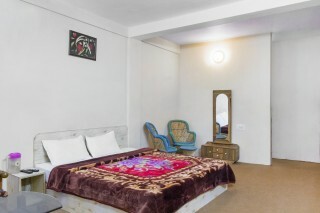 The retreat has ample parking space within the compound, and the room on offer is ideal for leisure travellers. 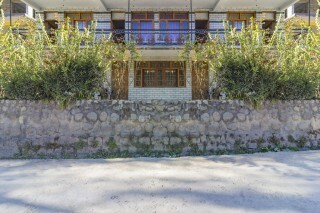 Your Space This abode flaunts an exposed-stone exterior that lends it an aesthetic appeal. 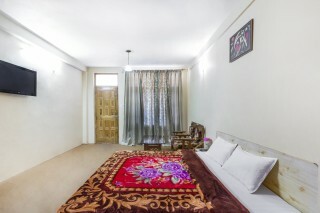 The room on offer is carpeted from wall to wall and has generous windows to facilitate ventilation. 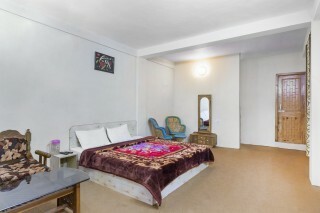 It is furnished with a cosy double bed for a sound sleep. A couple of cane seaters and cushioned armchairs with a coffee table are also present for added convenience. A wall-mounted television is set up here to ensure that you remain up to date with your favourite shows. A dressing table is provided to take care of your vanity needs. The en suite bathroom is tiled and appointed with western sanitary ware. 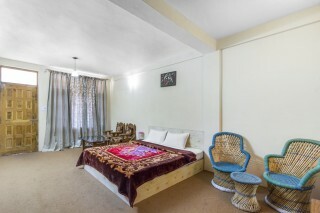 Guest Access Feel free to spend leisurely time in the common areas of the property when you are not in your room. 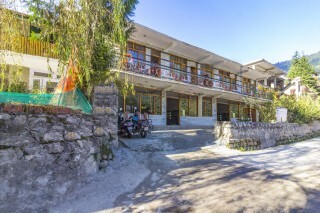 Guest Interaction Feel free to reach out to the staff or the caretaker present in case you need any assistance Neighbourhood Overview The property boasts a scenic view of the Manalsu River. Casa Bella Vista Cafe is located 450 m from the property. These are some of the other attractions nearby that guests can explore: The Lazy Dog Lounge - 450 m Dylans Toasted Roasted Coffee House - 260 m Renaissance Manali - 700 m Getting Around The property is located 2.1 km from HP Bus Stand Manali, 52.4 km from Kullu Manali Airport, and 165 km from Joginder Nagar Railway Station. Additional Information Guests are required to provide valid identification at the time of check in. Breakfast, lunch, and dinner are provided at an additional charge.